If you have access to each side of your bar molding, bar mount brackets are a great option for both a classy look and an added level of convenience. Built from stainless steel and in a durable brushed finish, this bar bracket, along with 2" metal tubing and other matching components, is a luxurious, convenient addition to any home or commercial bar. The stainless steel finish of this bar bracket will precisely match your Brushed Stainless Steel two-inch outside diameter bar rail tubing. Bar mount brackets include a back access bolt to allow for weight bearing on the bar rail. To install the bar rail bracket, you will need to use a screwdriver to attach the 3 mounting screws on the front end of the bar facing, and the nut and bolt assembly on the back end of the bar. The set screw goes into the hole where the bracket holds the tube and is screwed into the bar rail tubing. Overall the Foot rail I ordered from KEgWorks is excellent. high quality materials and finish. The installation is straight forward but one thing to know, and the reason for the 1 star, is that the thread in the supports are METRIC (M8 I believe) not standard US threads. I needed longer bolts for my application and checked with the customer service dept. They told me they were 5/16 course threads. As I was assembling things I realize the bolts I bought would not fit. I had to re tap the supports. Luckily I had a tap set. Thank you for your feedback! We will investigate the correct thread size of the included bolts to avoid this issue in the future. Thank you for your business. Cheers! looks like right bracket for application....oredering just one to check it out. Much easier to clean floors as well as your foot does not hit the typical floor support kind that rests on the floor. I also like the way it will look more like the foot rail is floating and have a sleek look/ modern. matches well and will affix to island in kitchen renovation. Specified by Architect/Designer for project. 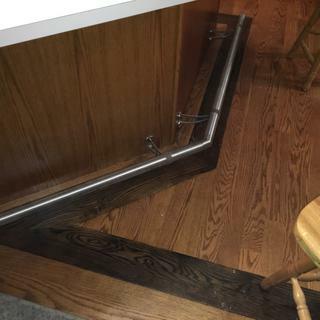 To put a foot rail around a table. I chose this one because both connections are to the bar. Pre-existing tile floor, didn't want to drill into that to affix the bracket. No holes in the floor. This particular item was for a specific project. It was a spec item. I needed a bracket that did not rest on the floor (carpeted) and this provided access to clean the area under the rail. can not access back of bar to use nut and bolts long lag bolt work? BEST ANSWER: Technically yes, but I wouldn't trust it. You'd probably have to drill the holes bigger on the bracket to get a decent lag bolt to work, and I would think, over time, with people stepping on it/putting weight on it, the lag bolt would start to pull out of the wood, causing damage to your bar. I actually returned this item and purchased the floor mounted, solved all my worries! Yes, but... it's got to go into sound wood, and end grain won't hold a screw as well as cross grain. I might consider a #14 stainless sheet metal screw instead. Better threads and thinner body. Remember to pre drill so body doesn't split the wood. You could epoxy coat the screw. It's a lube going in and glue when it cures. Either lag bolts or #14 screws will work. Depending upon the thickness of the wood you are attaching to you may have to reduce the dimension between brackets. The other option if there is a void behind the wood face is to use butterfly anchors. Bolt through and nut is best. You can use a long lag bolt. I would open up the holes in the bracket so you can up size the lag bolt diameter to give you more holding power. I had same situation and used lag bolts (longer and wider the better). No problem after 2 years. I do discourage people from standing or jumping on them. Good product. Good luck. Yes, that's what I did. Just have to make sure you have something solid to screw into. Works fine. Yes lags will work well you might add a extra bracket to a long run. That is what I did. Questionable. It needs to be super strong-trust me. People will stand on it. I used 2 inch lag bolts to attach it to the bar. What # size of screws are recommended for secure wall installation? BEST ANSWER: I mounted mine to the back of a kitchen counter cabinet. I put a SUPORT BEHIND the cabinet 3/4 x 3in. oak the length of the cabinet. I then through bolted the stud using a finder washer and elastic stop nut. The screws I used for the rest were #10 1 1/2 inch. through the cabinet and into the oak. We were not able to bolt from the backside of the wall per the included installation instructions. We used 2" and 3" #10 stainless screws in order to hit the backing that was installed in the die wall. That said, we also used this same bracket to mount the foot rail to the floor. 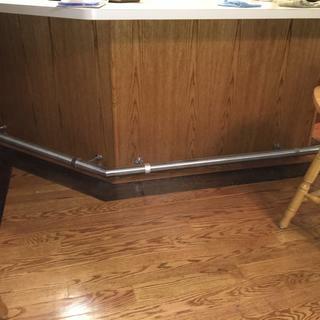 Our wall brackets were installed approximately every 4' and we split those spans with a bracket attached to the floor. I will say it is not how long of a screw but what surface are you mounting it on to? We had some concrete and some wood we had to grab....ultimately it was a 4 inch screw....I truly believe a wall mount supported by floor mount is the best way to go. I Believe the screws that came with the brackets were 2 inch length I wanted to go a bit deeper into the stud so went to home depot and got 3 inch screws same width. Just make sure you are anchored securely in the stud. I think about 2and a half inches the screws come with it. I don't recommend installing on a wall. Does the head of the nut have a slot for tightening. I have limited access to the rear of the bar (it's actually a kitchen island on wheels)? BEST ANSWER: There is no nut . The part has counter sunk holes for flat head screws. We used bolts through the bar with nuts on the back side. Only the brackets are included in the order. For your application, screws could be used, just make sure to use larger ones as your guests will put their full weight on the bar rail. If I remember correctly? It's a phelps head screw that tights the foot rail to the foot bracket! But!! You could always use a hex head screw to replace the ones that come with it! What is the distance from the top screw on the mounting bracket to the bottom screw hole? BEST ANSWER: It's 3 inches. A 3 inch long screw bolt with hex nut is included with each bracket your order. If you need a longer bolt for your specific setup you can find them at your local hardware store. If you have any additional questions, our bar rail experts will be glad to help you! You can call 877-636-3673 or email customercare@kegworks.com.